Kinginrin means "Gold and silver scales" and it is the name given to the sparkling scales that appear golden over red (Kin) and silvery over the black and white areas (Gin). 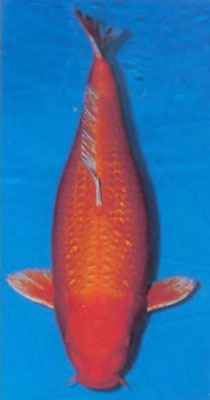 Usually referred to as simply Ginrin, this type of scale can occur in many varieties/classes of koi: Ginrin Kohaku, Ginrin Sanke, Ginrin Showa, Ginrin Shiro Utsuri, etc. 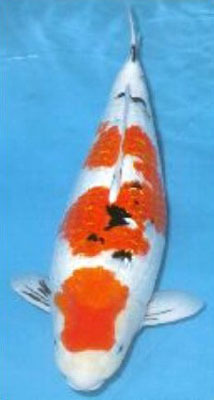 In order to be qualified for this class, a Koi must have at least two full rows of Kinrin or Ginrin scales. literally means Gold and Silver scales. A chemical deposit creates a sparkle effect on each scale. 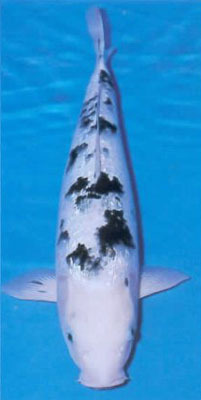 Many of the koi classes have been crossbred to have Kin Gin Rin scales but if a koi has two rows of Gin Rin scales, it is shown in Kin Gin Rin class. 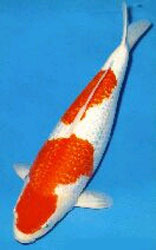 Koi with less Gin Rin scales are usually shown in their normal class and the scales may or may not affect the judging. 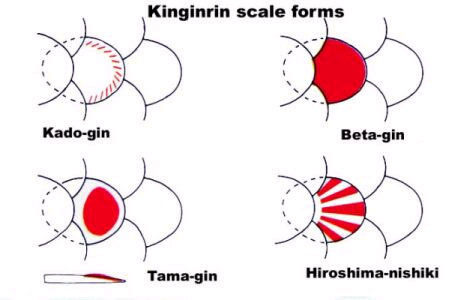 There are four types Kin Gin Rin scales. Pearl Gin Rin has a sparkle deposit in the center of each scale like a pearl. Diamond Gin Rin or Hiroshima Gin Rin looks like brushed aluminum sparkle. Beta-Gin is where the whole scale sparkles and is the most valued type. Kado-Gin has only the aft edge of each scale covered with this sparkling deposit. Gin Rin shows up best on white and red and does not show very well on black. It needs sunlight to be appreciated. The name "Kinginrin" means "Golden, silvery scale" and refers to those sparkling scales that appear golden over Hi and silvery over Sumi or white areas. These scales are generally divided into two different types, one where the scales have a heavy, almost lumpy sparkling deposit, and the other where the deposit on each scale is flat. The former type is called "Pearl Ginrin", "Tsubu-gin" or "Tama-gin". The shiny center of the scales stands out in relief, which makes the scales look three-dimensional. The latter type shows up in three forms. First, there is the "Beta-gin", where the scales are completely covered with a glittering surface. Such scales tend to appear on the abdominal region, along the lateral lines, or form two or three rows under the dorsal fin. 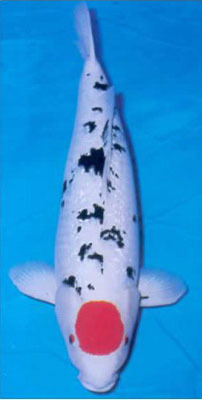 High-class Kinginrin koi are almost completely covered with such scales. 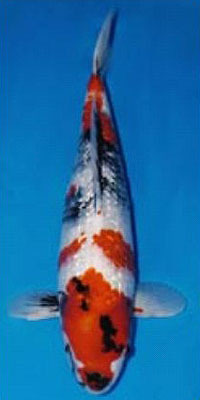 Second, there are the "Diamond Ginrin", where the scales have a brilliance similar to the gem for which the name comes. This form is also called “Hiroshima Ginrin” or “Hiroshima Nishiki”. These scales tend to spread neatly on both sides, but their superficial cracked glass appearance is regarded as coarse. Third, there is the "Kado-gin", where the sparkling deposit is found only on the scale edges (Kado means "edge"). Sometimes they are called “Sudare-gin”. The worst ones have silver lines on the tip of the fins. Their length is disorderly. Scales with this style deposit appear pointed and generally disliked. Beta-gin and Kado-gin scales are mixed, these two types spread randomly over the body. 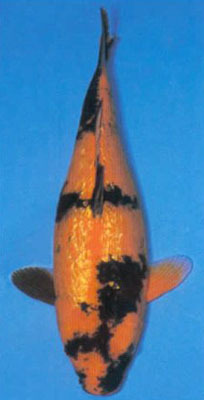 Kinginrin have greatly enriched the variety of Nishikigoi. 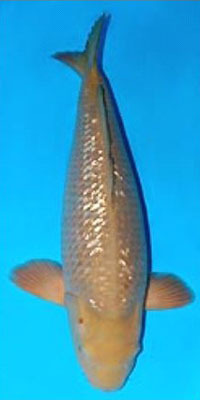 As they have been widely crossbred, Kinginrin forms of almost every variety can be found today. These types are named by using Kinginrin as a suffix such as in Kinginrin Kohaku, Kinginrin Sanshoku, and even Kinginrin Hikarimono.